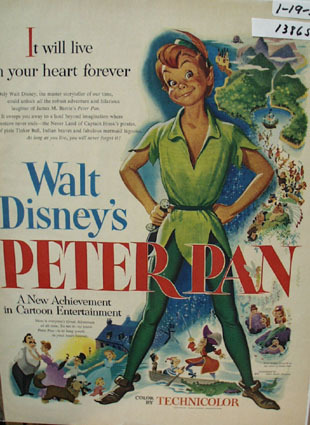 Walt Disney's Peter Pan Ad 1953 This is a nice color ad for Walt Disney's Peter Pan Technicolor movie with nice graphics from a January 19, 1953 magazine. Ad states where adventure never ends, the Never Land of Captain Hooks pirates, of pixie Tinker Bell. In mint condition. Photo is taken through plastic and may show wrinkles or crookedness that is not in the ad. This magazine tear sheet measures 10 1/2"" by 14"" tall. Items Similar To "Walt Disney's Peter Pan Ad 1953"
Walt Disney's MINNIE MOUSE Rug - Misc.